for their parking lot tailgates. 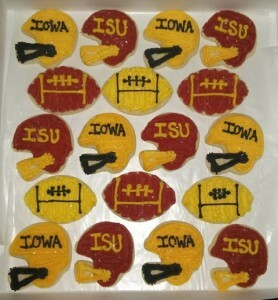 Saturday is the annual Cy-Hawk football game, a time when Iowans gather together for a day of fun and games. It’s time to round up the ladder golf and bean bag toss; mix up some dip and grab an extra bag of chips. Kickoff is 5 p.m. in Ames, so there will be plenty of time for tailgating. Latham Hi-Tech Seeds wanted to extend the fun, so today we’re hosting a companywide tailgate in Alexander. We’re grilling brats and burgers for lunch. But the main attraction, in my humble opinion (IMHO), is the buffet line. Each Latham Team member will bring an appetizer, side dish or dessert. 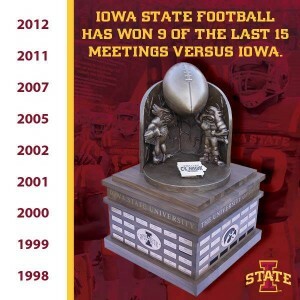 Iowa State Football has won 9 of the last 15 meetings with Iowa. Whether you’ll be watching the game from your living room, a parking lot or inside the stadium, have fun! Then remember to tune into the Cyclone Radio Network following the game for the Latham Hi-Tech Seeds Locker Room Show and commentary by analysts, players and coaches.